Review: Magic doesn’t come without patience. The payoff to a well-executed illusion doesn’t come without some sense of buildup or anticipation about what might be coming (or in the case of a handful of card tricks, where they’re coming from). 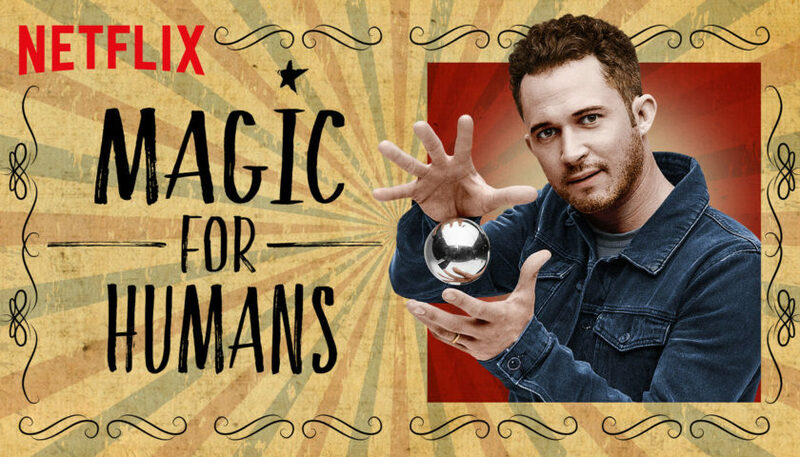 “Magic for Humans,” the new six-part unscripted series hosted by Justin Willman, shows a vital appreciation for a comedic patience that takes the whole thing from a set of mild curiosities to a finely tuned exploration of what kind of magic can still command people’s attention. Willman is seemingly the perfect magician/comedian hybrid prototype to pull off this kind of show, to help “Magic for Humans” exist in the perfect middle ground between comedy series and street magic special which can sustain a certain creative spark over the course of its six episodes. Also helpful is that each installment centers on a different universal theme. Some episodes center on love and companionship, others investigate guilt as a fundamental driving force for humanity. It’s in these thematic overviews right up top where the show establishes a very specific tone that works to its continuing credit. Even though Willman is talking directly to the camera, he somehow manages to bolster his credibility as a magician and storyteller while doing it in a self-deprecating way that keeps the whole process from getting overly heady. It’s clearly meant to engage the audience, but not in a way that’s trying to unlock some cosmic hidden pathway. Instead, “Magic for Humans” becomes a solid showcase for some incredible comedic timing, where the prestige is as much in the punchlines of these tricks as the magic itself. That shock that comes from wondering how a cell phone got from someone’s hand to all the way under layers of duct tape quickly morphs into a delightful celebration of how human perception works. “Magic for Humans” also draws some spiritual inspiration from food shows. Much in the way watching a chef ply their trade make can make an audience member more interested in the art of cooking, “Magic for Humans” is savvy in the way it teaches its viewers to think about how to be a better performer. Watching Willman and his very specific style of comic misdirection, part of the fun is slowly developing that same mindset over the course of six episodes. It gets to the point where you start to anticipate how Willman heightens each successive tricks. Once you start to see a move or two ahead, but can still be surprised by the final destination, it unlocks a new level appreciation of the work and the show. Even though precision is required to pull off plenty of these illusions, there are still times when the show allows a bit of uncertainty and even failure into what goes on. But even some of those steps that don’t quite go according to plan are ultimately baked into the DNA of the trick itself. In that way, it’s an ongoing lesson about the nature of perceived failure. It’s one philosophical idea that shines through, even if it’s one that’s not hammered explicitly. Being a magician is just like being a comedian or an actor or any other kind of performer, in that the job is turning rejection and disappointment into a secret asset that can subvert people’s expectations. We talked about Derren Brown‘s latest “Miracle” as proof that there’s a certain hurdle that filmed magic can’t get over: The idea that you can’t see it with your own eyes. Magic and the phrase “previously recorded” will almost inherently be at odds with each other because in the viewer’s mind there’s the possibility that whatever they’re watching has been tampered with to make it look fantastical. “Magic for Humans” mitigates that issue by taking it out of a performance venue and putting it in natural environments. Catching people off-guard in Griffith Park, at Meltdown Comics (RIP), or just out in a random parking lot makes for a much more organic experience. It doesn’t feel like you’re buying a ticket to something. There’s a spontaneity to tricks involving cell phones and playing cards that just work better underneath a lamppost than house lights. The simplicity of a lot of the sleight of hand, especially in the super-endearing “Magic for Susans” recurring segment, is the best example that “Magic for Humans” is best at its most basic. In later episodes, the show goes bigger with its setups and ambitions, and while some of those are fascinating (the elaborate group project to convince someone that he is invisible is somehow entertaining and dubious in equal measure), a speed-dating setup, a magic-based proposal, and a staged theft almost feel like part of a different. The pacing of the smaller tricks with a more simplistic prep (at least from the audience’s view) also allows the show to work in some pretty glorious reaction montages, building on the show’s strength in volume. Including a number of people‘s reactions to the same trick not only shows how effective Willman is at adapting to changing variables, it proves that different people respond to magic in different ways. Seeing people react with wonder, disbelief, revulsion, and apathy to the exact same trick is the show’s biggest way of keeping things from getting oversimplified. One of the most effective ways to do that is to think of magic as a tool, not a centerpiece. The actual sleight-of-hand often leads to an impressive closing reveal, but these individual segments are structured more like comedy sketches than grand displays of incredible feats. It’s a pleasant surprise to see the standard brooding strain of magic give way to something that feels more like a spiritual blend of Nathan Fielder and Bill Nye. Even though magic trades on the ability of the magician to do things their audience can’t, “Magic for Humans” isn’t so hyperfocused on Willman that it crowds out all other participants. Some sequences — like Willman performing for a classroom of children or working with a UCLA robotics lab — are as great as they are because they spread the wonder around. Willman is the mechanism for keeping the show moving forward, but it’s clear how much of the show is a team effort. Even if the credits didn’t list a number of creative consultants and segment producers that help each of these individual setpieces come to life, this also doesn’t work without the willing participants are given a chance to play along too, whether they’re a group of moms sitting around a dining room table or a bunch of kids flipping the classic “marshmallow experiment” on its head. Here, magic is something that happens with you, not to you. And “Magic for Humans” is a more rewarding experience because of it.